Round three of the Kids Quilt Round Robin really turned into a slog at our house. We didn't get started on the sewing for July until after our week of sewing camp. That meant that my kids were a little burnt out on sewing. R wasn't too late in finishing the large flying geese for her row for Norah. I love these colors and R really enjoyed sewing on the marked line for making the geese. 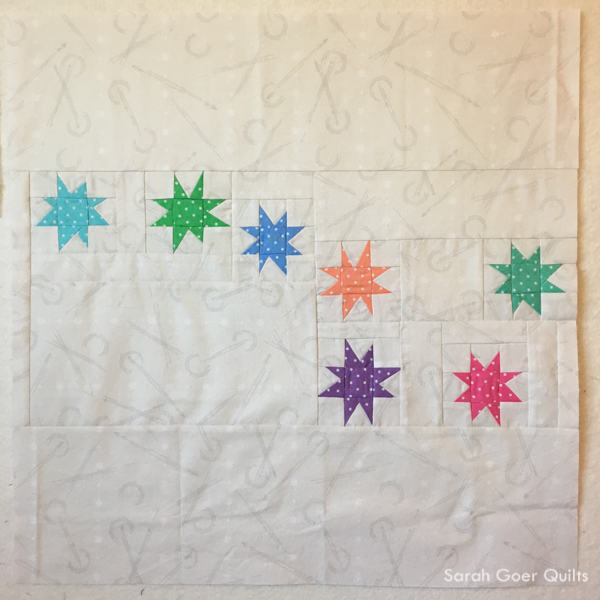 This is a great block for young quilters. The large size was great for her. The geese finish at 5" x 10". R's row is on the right. 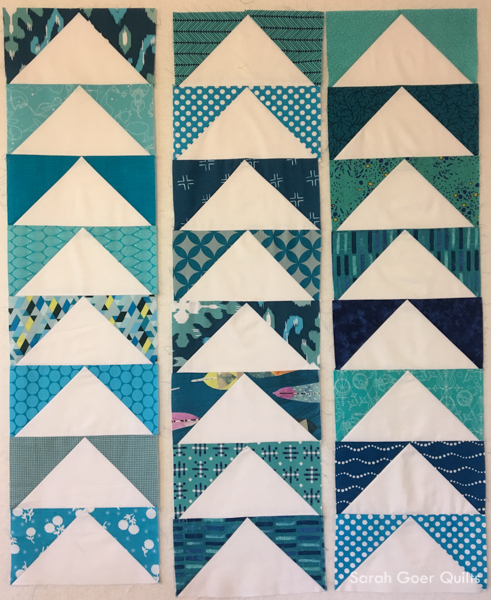 Norah's first row is in the middle, and the row on the left was made by the sister team of A & C.
G, on the other hand, took much of August to finish his 20" x 20" block. Sophie's theme was stars and constellations. I didn't realize what a big task we'd created for him when he decided he would make seven 3" wonky stars to make the Big Dipper on his block. 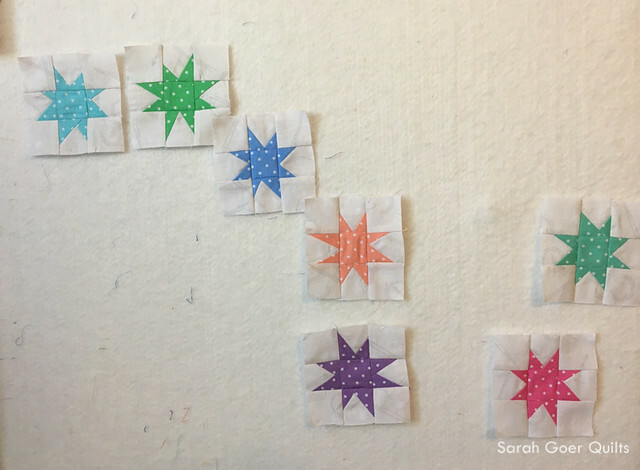 It was a lot of sewing (and a bit of resewing) to make those adorable stars. 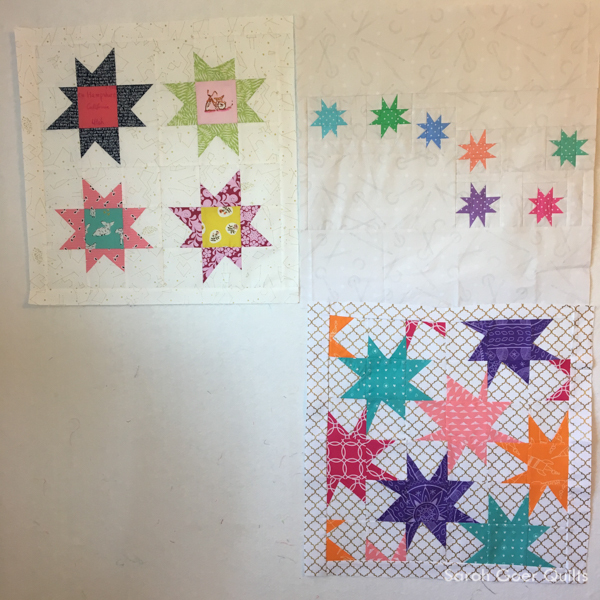 In the end, he set the final layout of the stars on my design wall and I puzzled it all together by adding the background fabric to bring the block to size. This is a great example of a block that was a little too ambitious, but I love how it turned out! It was sad for me to see it go. 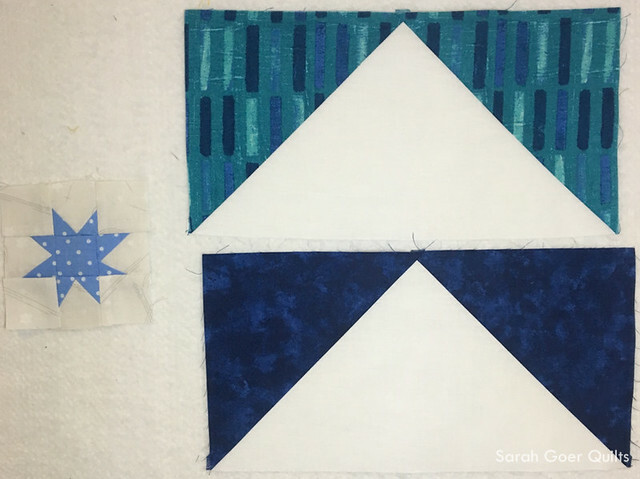 Sophie's original block is in the top left and the bottom right block was created by Hannah. Both of my kids are excited to be in the home stretch. We'll finish up the final round this weekend and look forward to receiving their projects back with all the blocks the others made for them. 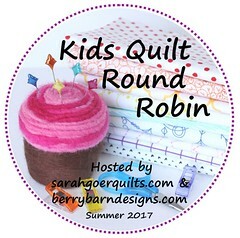 You can check out everything going on with the eight quilts in our Kids Quilt Round Robin on Instagram. Posted in Quilting. 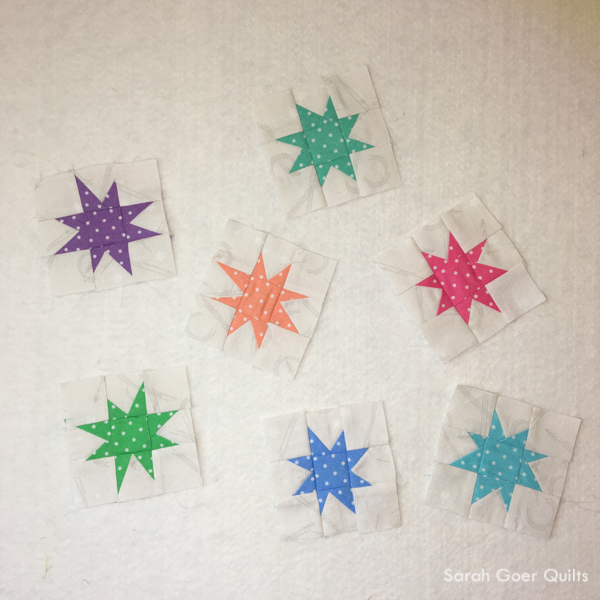 Tags: KQRR, quilting with kids on August 30, 2017 by sarah. 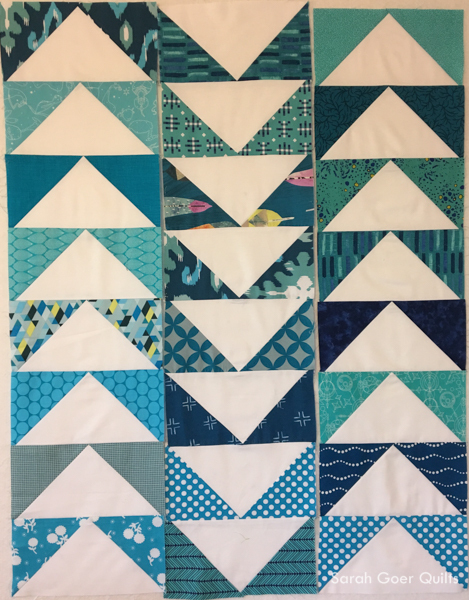 The blocks are looking amazing together and I'm looking forward to seeing how all the quilts come together. The block G made might have been ambitions, but it turned out beautifully! Thank you, Yvonne. I'll share your kind words with him. Way to go G & R (and mom!) on these fabulous additions!! 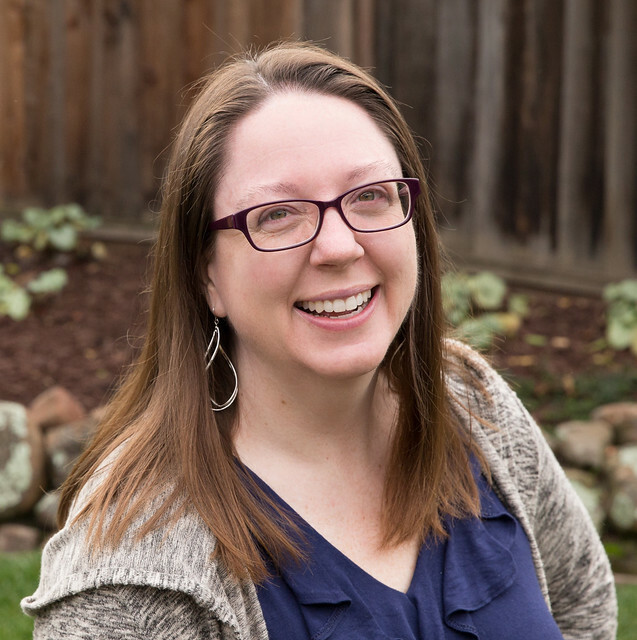 Thank you, Mel! I'll pass on your message to the kiddos. Thank you, Anja. The beauty of the overall design of his large block is that it was okay if the little blocks didn't finish perfectly to size.